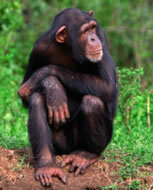 Scientists have identified a type of chimpanzee in West Africa as the source of HIV infection in humans. They believe that the chimpanzee version of the immunodeficiency virus, called simian immunodeficiency virus or SIV, most likely was transmitted to humans and mutated into HIV when humans hunted these chimpanzees for meat and came into contact with their infected blood. Over decades, the virus slowly spread across Africa and later into other parts of the world.